Previous Walden Wednesdays have focused on everything from strawberries to cougars to stink bugs. In short, wild (or mostly wild) things that we have around here and decided to learn more about. Today’s entry is far more mundane. Our subject: roosters. Yes, he is taking a piece of bread from my hand. 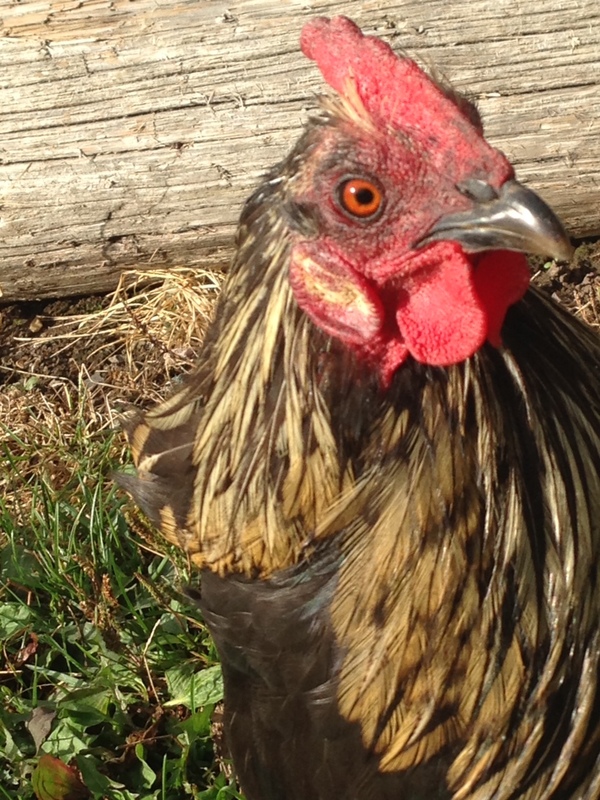 When we first got out here, he would run away from us, with all his hens following. Maybe he was traumatized after July’s chicken butcher, or maybe he had more common sense then. Then, one day, I threw him the crust of a sandwich I had eaten. Now, as I walk along the driveway, I hear this hilarious “pat-pat-pat-pat-pat” behind me and see him running after me, begging for something. I admit, I usually try to have something on hand. So far, he likes bread, crackers, and onion rings; he dislikes cold french fries and tofu; he tolerates mushrooms. The hens are also starting to follow me around. They are almost more fun to watch — the little grey one of the flock is the fastest, and I love to watch her dart in, steal an onion ring, and then take off running with it in her beak. 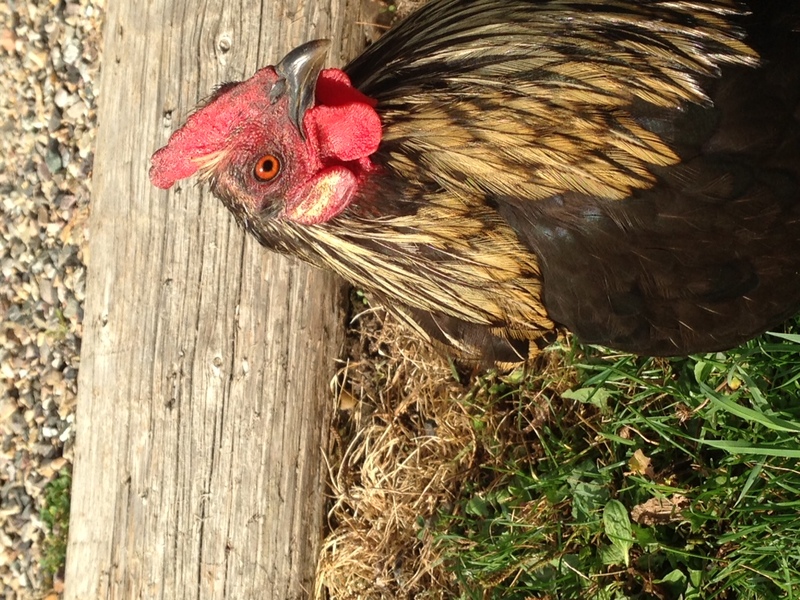 It’s easy to see why chickens in general have become such close companions. They’re easy to raise, don’t take up a ton of resources or space, provide meat and eggs, and are incredibly charismatic. You can find references to them, particularly roosters, in cultural narratives worldwide. The Chinese zodiac includes the rooster on its roster, and you can find references to roosters throughout both Testaments. Multiple cultures from the Hmong to the Yoruba to the Khasi incorporated them into their belief systems, and roosters were used for divination purposes by Zoroastrian cultures and ancient Romans, among others. 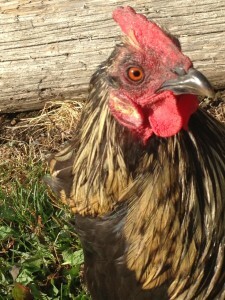 But moreover, roosters are hilarious. I mean, you stop and think about it — this little ball of strutting feathers and loud crowing is nothing more than a male chicken. They take themselves so seriously (roosters have clearly never heard of rule number 6!) And yet they aren’t so proud to come racing after me for a crust of bread. So here’s to you, rooster. Thanks for making the farm a more more entertaining place. It would not be the same around here without you. LOL You will have to teach him to fall down when you say “Bang”. I have always avoided roosters as I was told many times when I was a child growing up, about my Mother’s attack by a “rude rooster” when she was visiting her Aunt. This was in Ireland, and Aunt Martha lived in a typical Irish whitewashed stone, and thatched roof house. It had a dirt floor and the “door was always open”. She had, and was quite proud of her rooster and hens. My Mum and Grandmother were visiting from England, and Mum could very clearly remember sitting on a footstool, balancing a cup and saucer of tea, with a biscuit on the saucer. She noticed the chickens would come strolling in the open door, and she wanted to pet one but no longer had a free hand. Now, before they came over from England to visit, Mum had been at school, tripped and fell, and had a big scab on her knee. She sat on her footstool and listened to the talking that was going on around her, then noticed this very pretty bird with a lot of rust colored feathers walked in the door. It walked up to stand in front of her, and didn’t seem the least bit afraid. It’s little head was snapping back and forth, and it seemed to her to be “strutting” as it walked. To her delight it stopped right in front of her and looked….first one side…then the other, head going back and forth. To her shock and dismay the head suddenly snapped forward and pecked the large scab off her knee and ate it! Mum screamed, Nanny dropped her cup of tea, and Auntie Martha got up and “shoo, shoo, shoo, you filthy bird, away with ye!” Mum was thoroughly terrorized and hated roosters is not quite strong enough, she loathed roosters the rest of her life! I heard this story many times, with Nanny nodding her head in agreement of what a horrible day it was. I must admit, now I feel I have a edge in not really liking roosters, but I try to give them their own space! These are what dinosaurs have evolved to. And they taste like chicken. You trained him, so you should bring him and his harem up to the cabbage with you when you move! Banty roosters are the only nice ones we’ve found. All the other farm roosters met their fate before your arrival on the farm. But these ones? They treat their ladies well and don’t scratch the kids. Win win! 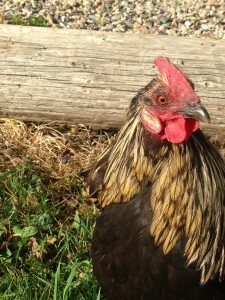 We adore our rooster, Dude! They are so much fun and such gentlemen. Enjoy your flock!